Meltemi 4-piece swing set, 223cm, with 2 swings, 1 tandem swing and 1 two-seated glider. Looking for new ways to keep the kids entertained, with safe and fun outdoor play? Look no further - this swing set by Alice's Garden is just the answer! Swings are a favourite among children. Starting from a young age, it provides them with a new kind of rocking sensation. This swing set is perfect for families and outdoor play. The frame is coated in epoxy paint, which limits rust formation, along with galvanised steel hardware, to help you make the most of your swing set. The injection-moulded plastic seats are incredibly sturdy and the synthetic ropes are rot resistant by nature. 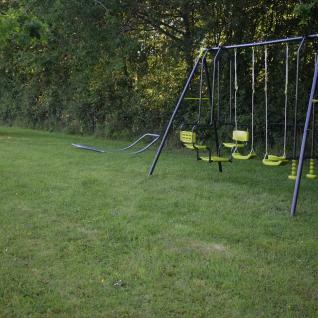 This swing set comes with two swings, a tandem swing and a glider. It comes delivered in a self-assembly kit with instructions in English.